A century ago, the life expectancy of a man living in the Florida Panhandle was less than 50 years. Women faired hardly any better. Yellow fever and malaria, parasites and poisonous snakes, sweltering heat and cataclysmic weather: These combined to make pioneer life in Northwest Florida one of the most challenging frontiers in the whole United States. Still, the settlers came, as the bounty and potential of the Panhandle were far too alluring. Rich farmland, primeval forests, abundant fishing and game, pristine coastline, and clean, fresh water held the promise of a good life and great wealth. So even in sometimes hellish conditions, paradise seemed within reach. Yet, in every paradise there are fallen angels, and Florida’s backwoods had its fair share of those. Post-Civil War, these bayous and timberlands became a haven for moonshiners, outlaws, and bandits as mean and wretched as any desperado of the American West. Walton County, the absolute heart of the Florida Panhandle, may have been the wildest community of all. 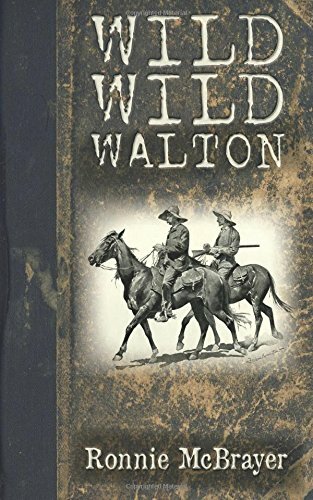 Before being splintered into Okaloosa, Washington, and Holmes Counties, Walton was some 3,000 square miles of wilderness patrolled by only a handful of law men and women. Peacekeeping was sporadic at best, but when applied, it was often by severe means. Inspired by the 2015 “Grit & Grace” production by the same name (www.gritandgrace.org), Wild, Wild Walton is Ronnie McBrayer’s exploration of pioneer justice in Florida’s Panhandle. Combining the elements of historical fact, oral storytelling, and narration, this is an exceptional look at the good guys and gangsters, the posses and picaroons, the devils and deputies who shaped Walton County’s past – and who continue to forge its future. Buy the book today at Amazon!